We make our high quality lift servicing available 24/7, 365 days a year. We have expert lift engineers ready to bring our specialist services to you. R J Lift Services Ltd work with independent testing companies who are fully accredited by UKAS for testing, inspection and certification. With a fully accessible nominated user portal our clients can view their own current LOLER status and download or print LOLER reports. As an additional asset management service to our clients and to comply with regulations we view all certificates daily. We then immediately notify our clients of issues raised and the recommended course of action. A thorough examination is required by LOLER lifting regulations. These regulations apply to all organisations whose employees use lifting equipment whether owned by them or not. 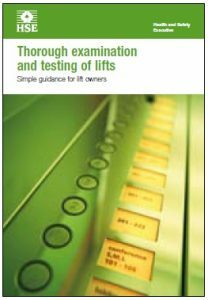 Regulations place the responsibility of finding a competent person to regularly inspect lifts on the lift owner or site manager. LOLER thorough examinations are required by law to improve health and safety and reduce the risk of accidents due to faulty or un-serviced lifts. Duty holders are responsible for ensuring lifts are examined at statutory intervals. LOLER inspections must be carried out every 6 months for passenger lifts or 12 months for goods lifts) to ensure they are safe to use. Lifts and hoists used to lift people or loads must be examined by a ‘competent person’. Any defects or faults with lifting equipment must be remedied promptly. Accurate records and documentation must be kept and made available. Whilst LOLER thorough examinations act in a similar way to a cars MOT, PUWER inspections regards the maintenance and servicing of a lift, just like servicing a car. Places the responsibility of maintaining machinery, such as lifting equipment, with companies who own, operate or have control over the machinery. Work equipment is regularly maintained to upkeep a safe condition. Equipment is inspected to detect faults and improve health and safety. Proper health and safety measurements are in place in the event of equipment failure. Lift maintenance is restricted to those with full training and qualifications. Our engineers have maintained and services lifts to PUWER standards throughout the UK for more than 25 years. Having received extensive training, they are fully competent and ensure your lifts are running efficiently and safely. As one of the UK’s leading Independent lift companies, R J Lift Services Ltd can offer you skilled service, extensive experience and very competitive rates. Contact us now for more information or a quote. For full details on LOLER regulations click here, or for more details on PUWER regulations click here. In addition to learning about our thorough lift examinations, feel free to browse the rest of our site to learn about our extensive services including: installations, maintenance, repairs and more. As a lift company, our mission is simple. We strive to deliver the highest quality lift services in the industry. Plus, our expert lift engineers and professionals are available to you 24/7 365 days a year. We look forward to solving life maintenance concerns and emergencies all across England, Wales, Scotland and Northern Ireland including major cities such as Aberdeen, Dundee, Glasgow, Edinburgh, and much more.